All class content ©twopeasinabucket.com. Click here to view supplies and full details. It’s the thirtieth of the month, so that means it’s time for a brand new edition of 4×6 Photo Love! This is the final lesson in the year long class. Since it’s the twelfth month of the year, we’re scrapbooking a full dozen 4×6 prints on one scrapbook page – and it’s even a single page layout, if you can believe it! 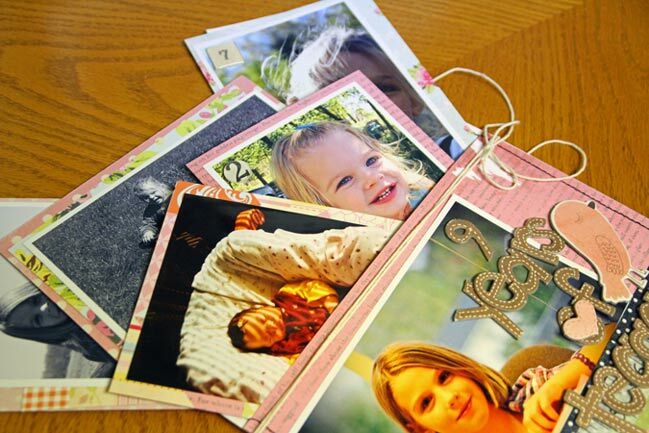 This month’s idea is super simple: create a stack of photos and attach them to the top of the layout with string, twine or ribbon. With double-sided patterned papers, you can make the stack of photos extra pretty and colourful. I used the Little Black Dress collection from BasicGrey for one layout and a mix of collections from Studio Calico for the second page. Depending on how you prefer things in your album, the loose mini pages can stay inside the page protector or you can attach them so they are on the outside of the page protector with just a little tweaking. Punch the hole through the page protector as well as the layout, staple or sew through the page protector, or just cut part of the page protector away. You can also cut extra page protectors to size to fit all the photo layers. Stitch them or close the edges with pretty washi tape. Stop by Two Peas to download a PDF with notes on this project and visit the Education message board for all the Two Peas classes. You can find Leah’s project here at Two Peas to add to your bookmarks. Every month, there are two ways to win a prize for participating in 4×6 Photo Love! The first is at Two Peas: create your page and upload it to the gallery. Be sure to tick the box for this challenge in step four of the upload process. One participant will win a gift certificate to Two Peas to go shopping for whatever you like. But there’s a second chance to win right here: on this post, leave a comment with a link to your page (in the gallery at Two Peas or on your blog, whatever you prefer) and one of those links will win Two Peas shopping money too! The deadline for both is the 29th of January. Congratulations to Gaby for winning the draw for last month’s eleven photo class! (Gaby, I need your email address. Can you contact me at shimelle at gmail dot com please?) Will you be next? Just choose twelve 4×6 photos to scrap and follow along with this month’s class prompt. PS: Feel free to grab the button there on the left for your blog or to share this class with a friend – since it’s free, the more the merrier! This is our final update to this project but it will continue to be available for free to help any scrapper with ideas for 4×6 pictures. It’s the thirtieth of the month, so that means it’s time for a brand new edition of 4×6 Photo Love! Since it’s the eleventh month of the year, we’re scrapbooking eleven 4×6 prints on one scrapbook layout – which is quite possibly an eye-crossing endeavour, but it is possible! Grab some photos and join in the fun and games. I shall swear up and down that this month’s design isn’t cheating – it still counts as one layout to me! It starts with a double page spread including seven 4×6 prints (I used three portraits and four landscapes) then an extra 6×12 page in the middle holds four more landscape images and two journaling cards. With so many photos on the page, you’ll find that it comes together rather quickly and without a huge stack of supplies, since more of the page than usual is filled with photographs. This month’s pages are definitely easier to see on video than in still pictures, so watch this month’s pages come together when you have a minute! This month I’m joined by special guest (and scrapping friend!) Leanne Edwards with her take on this design principle. She printed a big stack of photos from her wedding reception at 4×6 and they are all landscape, so she adapted the design to work perfectly with the pictures she wanted to scrap. I love the bright colours and the party feel from all those polka dots! You can find Leanne’s project here at Two Peas to add to your bookmarks. Every month, there are two ways to win a prize for participating in 4×6 Photo Love! The first is at Two Peas: create your page and upload it to the gallery. Be sure to tick the box for this challenge in step four of the upload process. One participant will win a gift certificate to Two Peas to go shopping for whatever you like. But there’s a second chance to win right here: on this post, leave a comment with a link to your page (in the gallery at Two Peas or on your blog, whatever you prefer) and one of those links will win Two Peas shopping money too! The deadline for both is the 29th of December. Congratulations to Karen for winning the draw for last month’s ten photo class! (Karen, I need your email address. Can you contact me at shimelle at gmail dot com please?) Will you be next? Just choose eleven 4×6 photos to scrap and follow along with this month’s class prompt. What if I don’t have those page protectors? PS: Feel free to grab the button there on the left for your blog or to share this class with a friend – since it’s free, the more the merrier! And you’re welcome to use any supplies and any photos, so there’s no boundaries to your scrapping with this year-long project. It’s the thirtieth of the month, so that means it’s time for a brand new edition of 4×6 Photo Love! Since it’s the tenth month of the year, we’re scrapbooking ten 4×6 prints on one scrapbook page. Grab some photos and join in the fun! This month’s design is essentially a double page layout, but it’s back to back rather than two facing pages, because it’s all built with a divided page protector. This particular page protector is 10×12 and holds three landscape and two portrait photos on each side for a total of ten 4×6 prints. This style of scrapping is very different than starting with a 12×12 page as the background. In fact, you make the whole page without any paper which is a little different indeed! 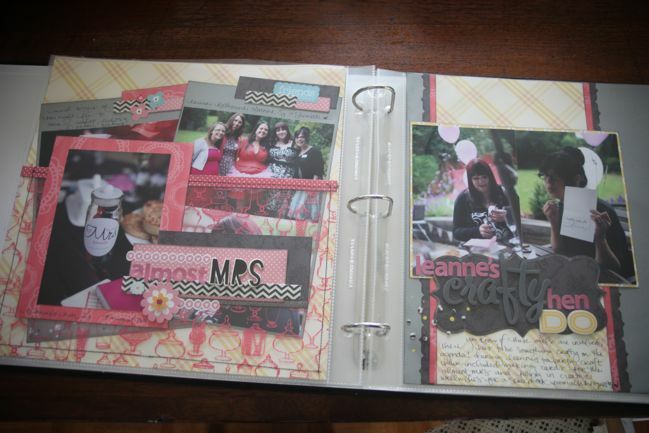 I like that you can add embellishment on top of the page protectors and keep the photos safe and intact inside. And the 10×12 size means you can add a border or something unexpected to the edge of the page, and I love how that creates a layered effect in the album. This month I’m joined by special guest Piradee Talvanna with her take on the 10×12 divided page protector. At first glance, the page is lovely of course, but then there’s a surprise! You can find Piradee’s project here at Two Peas to add to your bookmarks. Every month, there are two ways to win a prize for participating in 4×6 Photo Love! The first is at Two Peas: create your page and upload it to the gallery. Be sure to tick the box for this challenge in step four of the upload process. One participant will win a gift certificate to Two Peas to go shopping for whatever you like. But there’s a second chance to win right here: on this post, leave a comment with a link to your page (in the gallery at Two Peas or on your blog, whatever you prefer) and one of those links will win Two Peas shopping money too! The deadline for both is the 29th of November. Congratulations to Johanna for winning the draw for last month’s eight photo class! (Johanna, I need your email address. Can you contact me at shimelle at gmail dot com please?) Will you be next? Just choose ten 4×6 photos to scrap and follow along with this month’s class prompt. Using these page protectors is not a requirement of entering the challenge. If you don’t want to add these to your stash, that’s fine! There are two more options for you to follow the same design principle: you can create a paper page with the same photo layout, as either back to back or facing pages OR you can use a standard page protector and create your own pockets by stitching and cutting the plastic accordingly. Get creative with whatever you do have and show us how you’ve added ten 4×6 photos to your album! All class content ©twopeasinabucket.com. Click here to view supplies and download this month’s PDF. It’s the thirtieth of the month, so that means it’s time for a brand new edition of 4×6 Photo Love! Since it’s the ninth month of the year, we’re scrapbooking nine 4×6 prints on one scrapbook page. Grab some photos and join in the fun! This month’s design principle is a pocket page, perfect for a transparency! Eight of the photos are adhered to cardstock and they can easily be removed from the pocket through the top of the page protector, so there’s no need for customisation this time. Of course, the pocket can hold more things if you like – more space for writing or even more pictures. You might recognise that layout on the right from a recent sketch. It turned out that I had nine photos remaining from that event, so it seemed the perfect pick – plus I could take my inspiration from the colours and patterns from that page I had already created. It’s not a true double-page spread but a happy circumstance that the two can look coordinated across the page divide. You can see how I picked the supplies and how I made the layout in this month’s video. …and her second page here. I love how Mandy incorporated her favourite border punch into the design and got creative with the papers to hold her photos inside the pocket. Every month, there are two ways to win a prize for participating in 4×6 Photo Love! The first is at Two Peas: create your page and upload it to the gallery. Be sure to tick the box for this challenge in step four of the upload process. One participant will win a gift certificate to Two Peas to go shopping for whatever you like. But there’s a second chance to win right here: on this post, leave a comment with a link to your page (in the gallery at Two Peas or on your blog, whatever you prefer) and one of those links will win Two Peas shopping money too! The deadline for both is the 29th of October. Congratulations to Lisa for winning the draw for last month’s eight photo class! (Lisa, you will receive your gift certificate by email.) Will you be next? Just choose nine 4×6 photos to scrap and follow along with this month’s class prompt. Class content ©twopeasinabucket.com. Click here for supplies, a PDF and further details. The thirtieth of August already? It’s 4×6 Photo Love time! And that means scrapbooking eight 4×6 photos on one layout. Hope you’re ready for a big stack of prints! This month’s design concept involves creating a page and a half, more or less. By sewing two page protectors together and cutting a second page to a smaller size, the two pages layer to create one layout with plenty of room for photos. This design is great for a mix of landscape or portrait photos, which I know has been an extra challenge for some of you with the previous editions. See? Plenty of space! And with this layout in the mix, I can even say we’re still on-theme for wedding week! The yellow and grey version includes lots of Amy Tangerine for American Crafts plus some Studio Calico paper and Martha Stewart butterflies. I have to admit the interactive nature of these pages makes them easier to see via video than just these still photos. So go on and press the play button. And I didn’t even mention wedding week to this month’s special guest and she hit it right on the head! The lovely Sally Danes is my special guest this month. She adapted the idea to include eight portrait prints and I love how this came out with the pretty simplicity of the white cardstock background and plenty of Thickers! 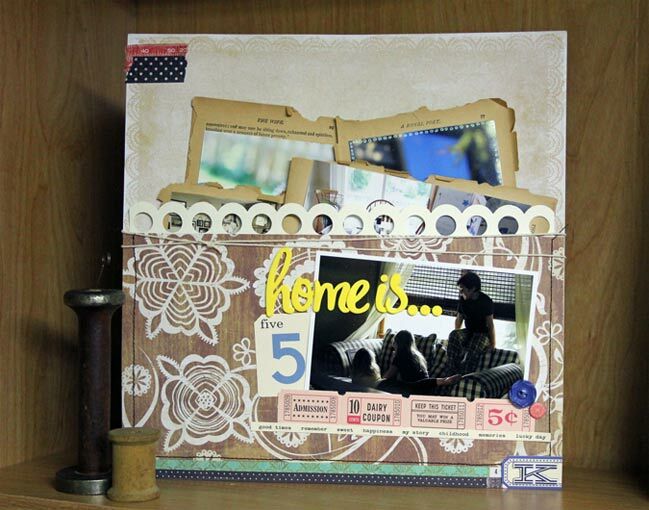 Check out more scrapping from Sally here on her blog. Every month, there are two ways to win a prize for participating in 4×6 Photo Love! The first is at Two Peas: create your page and upload it to the gallery. Be sure to tick the box for this challenge in step four of the upload process. One participant will win a gift certificate to Two Peas to go shopping for whatever you like. But there’s a second chance to win right here: on this post, leave a comment with a link to your page (in the gallery at Two Peas or on your blog, whatever you prefer) and one of those links will win Two Peas shopping money too! The deadline for both is the 29th of September. Congratulations to Talia for winning the draw for last month’s six photo class! (Talia, you will receive your gift certificate by email.) Will you be next? Just choose eight 4×6 photos to scrap and follow along with this month’s class prompt. All class content ©twopeasinabucket.com. Click here for supplies and here to chat on the message board. Right about now is when I should start to panic in the 4×6 Photo Love class. Beyond the half-way point means it only gets tougher to add that extra photo to the layout each month, but actually I’m quite excited about all the extra tricks we can throw in now to create plenty of space for all those 4×6 shots. You can check out the newest edition now, with seven 4×6 photos on a single page layout. Neither layout this month is on kraft cardstock – shocking, I know! One is travel themed but the other uses a stack of photos from our wedding reception that I have been meaning to scrap for ages but I kept putting it off because it was a big stack of images that wouldn’t ordinarily go on one layout. But I love how they can all live on one page now! This month, the lovely Julie Kirk is my special guest and she adapted the page design to feature landscape photographs. I love the colours and patterns she used on this page. But this is so very clever! She explains her process for the rope ladder technique here, so you can try it too. Thank you for joining me, Julie! Every month, there are two ways to win a prize for participating in 4×6 Photo Love! The first is at Two Peas: create your page and upload it to the gallery. Be sure to tick the box for this challenge in step four of the upload process. One participant will win a gift certificate to Two Peas to go shopping for whatever you like. But there’s a second chance to win right here: on this post, leave a comment with a link to your page (in the gallery at Two Peas or on your blog, whatever you prefer) and one of those links will win Two Peas shopping money too! The deadline for both is the 29th of August. Congratulations to Connie for winning the draw for last month’s six photo class! (Connie, you will receive your gift certificate by email.) Will you be next? Just choose seven 4×6 photos to scrap and follow along with this month’s class prompt. 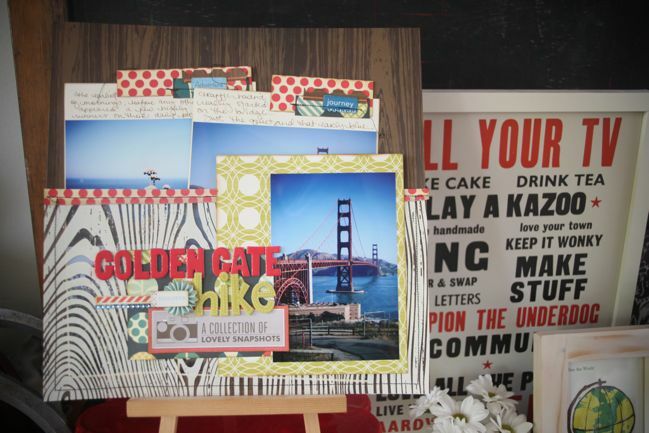 I can’t believe we are already at the half-way point for 4×6 Photo Love, the online scrapbooking class I’m teaching throughout 2011 at Two Peas! (If you haven’t heard about it until now, it’s free and you can jump in at any time.) The lessons post on the 30th of each month, so that means I have the June edition to share with you, and it’s all about scrapping six photos this month. This month’s design concept is a variation of what we created with three photos in March. Then we lined them up to go all the way across a 12×12 page. This time we’re placing them all the way across two pages to make a double page layout, but also offsetting the photos with boxes of patterned paper to create a bit of a zig-zag effect. I’ve used portrait photos for the examples, but if you only have landscapes, you could try turning the pages so you have two columns of three photos from the top to the bottom of the page rather than one long line from left to right. Have a look at this month’s video to get a better idea of how these pages were constructed. Both my examples are travel related, purely because that tends to be when I take the most photos and there aren’t many other events where I would have six portraits that all worked together – but that’s just me! You are welcome to participate with any theme, colours and supplies you would like. Page by Jamie Sorenson. Click here for supplies. This month I’m delighted to feature Jamie Sorenson as my guest. She’s our community manager (and the Garden Girl boss!) at Two Peas, so she’s a face many peas know from the message boards and newsletters, but she’s also a fab scrapbooker and I love her creative spirit. This layout is just what I mean – she took my boxed-out, linear sketch and infused it with youthful energy for these family photos. Try tilting the pictures and adding embellishments that don’t have to sit right inside each of the patterned paper boxes. You can add this page to your bookmarks here. Thank you for joining me, Jamie! Every month, there are two ways to win a prize for participating in 4×6 Photo Love! The first is at Two Peas: create your page and upload it to the gallery. Be sure to tick the box for this challenge in step four of the upload process. One participant will win a gift certificate to Two Peas to go shopping for whatever you like. But there’s a second chance to win right here: on this post, leave a comment with a link to your page (in the gallery at Two Peas or on your blog, whatever you prefer) and one of those links will win Two Peas shopping money too! The deadline for both is the 29th of July. Congratulations to Daphne for winning the draw for last month’s five photo class! (Daphne, you will receive your gift certificate by email.) Will you be next? Just choose six 4×6 photos to scrap and follow along with this month’s class prompt. I hope you enjoy a bit of double-page fun! All class content ©twopeasinabucket.com. Click here for supplies and here for this month’s message board thread. 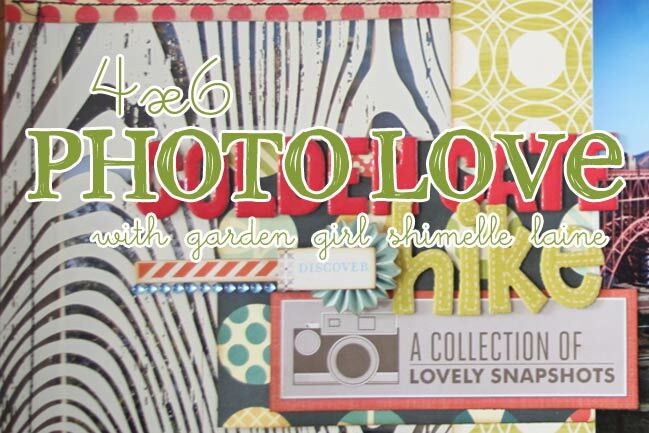 It’s the 30th of the month, which means a new edition of 4×6 Photo Love, a free online scrapbooking class I’m teaching all year at Two Peas in a Bucket. As it’s the fifth month of the year, we’re scrapping five 4×6 photos. This month’s design is… gasp… a double page! So something a little different than the four prompts so far. It’s not all doubles from here on out though – some of the pages later in the year pile on a surprising number of 4×6 prints on a single 12×12! But this month, I’m hoping you’ll give the double page layout a try. The design concept this month includes four of the photos as landscape, so they can create a straight line all across the double page. Then borders go above and below the photos, and a fifth photo is added above the line. That picture can be either portrait or landscape, and it’s a great way to give a bit of special treatment to a single photo. Click here for a printable PDF, full list of supplies and more details on the class page at Two Peas! This month I have two special guests playing along with the class. This first page comes from May Flaum, who you might remember from her five ideas post not too long ago! May opted for embellishing the middle border, all the way across the page. Perfect for lots of little bits and bringing in plenty of colour and texture! Check out May’s page and supply list here at Two Peas and if you like her style, be sure to check out her blog and Etsy shop too. My second guest is Melissa Stinson, often better known as the Scrappy Jedi. I love how she added her embellishment to the top left corner of the layout, so that’s a third option while still using the same basic outline for your two page layout. Click here to see Melissa’s supplies and to add her page to your Two Peas bookmarks. Every month, there are two ways to win a prize for participating in 4×6 Photo Love! The first is at Two Peas: create your page and upload it to the gallery. Be sure to tick the box for this challenge in step four of the upload process. One participant will win a gift certificate to Two Peas to go shopping for whatever you like. But there’s a second chance to win right here: on this post, leave a comment with a link to your page (in the gallery at Two Peas or on your blog, whatever you prefer) and one of those links will win Two Peas shopping money too! The deadline for both is the 29th of June. And it’s time to catch up with some winners while I’m on that subject! I’m happy to announce Jen, Charity and Lisa all have 4×6 Photo Love prizes coming their way! Will you be next? Just choose five 4×6 photos to scrap and follow along with this month’s class prompt. I hope you enjoy a bit of double-page fun!